These rye pancakes, unlike most whole-grain flapjacks, are a combination of all-purpose and rye flours for a remarkably delicate, light, and nutty breakfast. On top are succulent pears sauteed in butter and tossed in maple syrup. Oh, mamma! 1. In a large skillet over medium-high heat, melt the butter. Add the pears and cook, stirring occasionally, until just tender, 5 to 10 minutes. Stir in 1/2 cup maple syrup, season with salt, and remove from the heat. If you have a sweet tooth, go ahead and add the remaining 1/4 cup maple syrup. Otherwise, you can keep the rest handy and drizzle it over the pancakes later if you decide you need it. Cover to keep warm. 2. Whisk the milk with the eggs and the melted butter in a medium bowl. In a separate medium bowl, whisk together the rye and all-purpose flours, the sugar, baking powder, and 3/4 teaspoon salt. Add it to the milk mixture and stir just until completely incorporated. The batter will be thin and probably a little lumpy. That’s okay. 3. Heat a griddle or large skillet over medium heat and brush lightly with melted butter. Ladle 4-inch (10-cm) rounds of batter onto the griddle. Cook until bubbles appear on the surface of the pancakes, 2 to 3 minutes. Flip and cook until the pancakes are risen and golden brown, 1 to 2 minutes more. Repeat with the remaining batter. It may be necessary to reduce the heat to low if the pancakes start to brown. Transfer the pancakes tto plates and repeat with the remaining batter. 4. 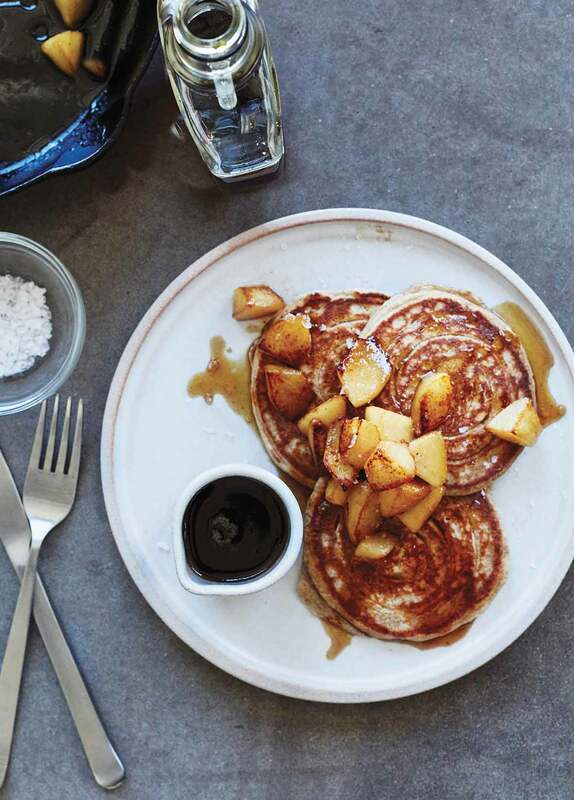 Serve the rye pancakes topped with the maple-pear compote and devour immediately. If pears aren’t your thing, you can always swap our them out for tart apples, such as Granny Smith. Cook an equal amount of peeled, cored, and cut apples as stated in the recipe. Depending upon their firmness, you may need to cook the fruit a bit longer. These rye pancakes drew an enthusiastic response from my helpers. “Buttery and delicious!” “Fluffy!” “This is how pancakes should taste!” “Congratulations! They were a hit!” That’s just a sampling of the feedback. I wasn’t originally sure if the rye flour would be too hearty for the others, but I come from a couple rye-eating cultures (Swedes and Jews), so I felt I would be right at home with these rye pancakes, no matter how others might feel. It’s a kindred spirit type of comfort food. As it turned out, I need not have been concerned. I had a fairly lumpy batter, which was okay with me, as I feel that is generally fine with most pancakes. My first pancake cooked for precisely 3 minutes on the first side and 2 minutes on the second side. Subsequent pancakes took less and less time till I was down to a 3-minute pancake at the end—2 minutes on the first side and then 1 minute on the second side, even when I turned the heat down to low. I used a well-seasoned cast iron pan. Although it looked like too much syrup, every drop was devoured, and I think some folks might have licked their plates clean. Perhaps it’s the butter?! Five tablespoons plus more for the skillet is a healthy amount of butter. And real maple syrup. And a maple-pear compote, which are more special than apple. I was concerned that they were too unripe to use, but that unripeness meant they were perfect for the sauté step. In the future, I might consider a sturdier pear. I would also cut them a bit smaller. I wondered about not peeling them, and might try that for a future batch, especially if I were to use Red Bartlett pears, as they would add some nice color to this otherwise cream, beige, and brown presentation. These rye pancakes are delightful, easy to make on the spur of the moment, and rival overnight buckwheat pancakes for delicate texture but toothsome flavor. I made a half recipe to serve 2 people and this recipe scales perfectly. While pears are now gone from our orchard, I did happen to have some local Pippin apples and they substituted perfectly. I assembled and measured my ingredients for the pancakes first, then prepared the sauteed apples. I realized as I was measuring the maple syrup that I was going to be short, but honestly, for our taste, we found using less maple syrup to be perfect. This cooked very quickly—2 minutes a side and my cast iron was a bit hot on one side, so I really had to watch it and turn the heat down a bit. No need to be too aggressive on the heat for the pancakes. The presentation was nice, the texture was light, and the taste was not overly sweet. We enjoyed a very rare treat of a pancake breakfast. 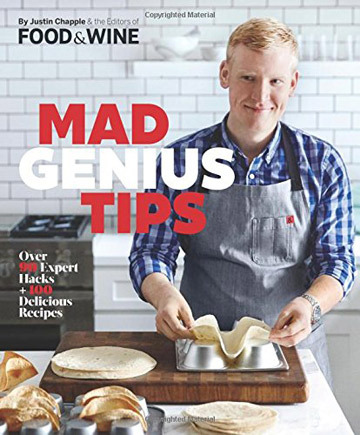 Rye Pancakes with Maple-Pear Compote Recipe © 2016 Editors of Food & Wine. Photo © 2016 John Kernick. All rights reserved. All recipes and photos used with permission of the publisher.